Vorticella is a genus of protozoa, with multiple species. Vorticella live primarily in fresh water streams and ponds. 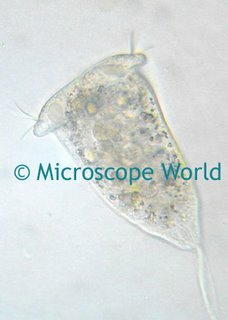 You may be able to locate some in a fresh water stream near your house and look at it under your microscope. Vorticella are most commonly viewed at 400x magnification. Vorticella often stay in clusters, so when looking through the microscope you may notice them grouped together in your field of view. The Protozoan Video, "In the Eye of the Needle" discusses Vorticella in more detail, as well as the Teacher Handbook on Protozoans.